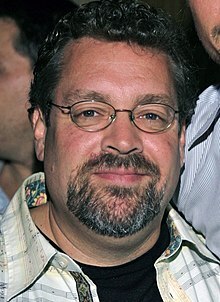 Gary Scott Thompson (born October 7, 1959) is a screenwriter, television producer, and director. Thompson is most notable for his work on The Fast and the Furious starring Vin Diesel, the sequel 2 Fast 2 Furious, Hollow Man with Kevin Bacon, Split Second, 88 Minutes, starring Al Pacino, and K-911 and K-9: P.I..
As creator, showrunner, writer, and executive producer of NBC's hit series Las Vegas, Thompson also directed 4 episodes and made a brief appearance as a psychotherapy patient. Recently, Thompson wrote, co-developed, and executive produced NBC and TF1's Taxi Brooklyn. Born in Ukiah, California, but spending much of his childhood in American Samoa, Thompson first gained exposure to the world of entertainment actor, studying the craft from such actors as Powers Boothe. To pay for his education and support himself, Thompson worked in a junkyard, operated heavy equipment, delivered mail, built sets for a theatre company, tutored college students in English, taught high school in New York City, worked in a gym, was a stagehand at the Metropolitan Opera House NYC, was a reader and assistant dramaturgy at Circle Rep Theatre, and did story notes and development for a Hollywood film studio and distributor. For Las Vegas, Thompson received the honor of Best Drama Series at the WIN Awards, an awards show dedicated to highlighting positive and multi-dimensional portrayals of women in media. Additionally, Thompson received the first-ever Visionary Award from spinal cord injury advocacy organization Life Rolls On for the first-ever portrayal of a featured character with a SCI on national television. ^ Bierly, Mandi (January 11, 2008). "Las Vegas: Against All Odds". Entertainment Weekly. Retrieved October 27, 2012. ^ About, Gary Scott Thompson was born in Ukiah, California, and grew up on the South Pacific island of Pago Pago, American Samoa. ^ About, Thompson worked in a junkyard, operated heavy equipment, delivered mail, built sets for a theatre company, tutored college students in English, taught high school in New York City, worked in a gym, was a stagehand at the Metropolitan Opera House NYC, was a reader and assistant dramaturgy at Circle Rep Theatre, and did story notes and development for a Hollywood film studio and distributor. ^ "2005 Film and Television Winners". Women's Image Network Awards. September 26, 2005. Retrieved September 14, 2015. ^ Surfermag.com This year’s gala will proudly salute the work of producer Gary Scott Thompson and his hit NBC-show “Las Vegas” for its positive portrayal of the SCI community in the media. This page was last edited on 1 April 2019, at 19:33 (UTC).